Just enough time is spent on this dramatic shift before the story flows naturally into the actual plot. We start to get a sense how this Doctor operates—rather than asserting authority by force of will, he instead acts so erratically that people don’t know what to think and thus cede control to him. Despite it being in the title and thus not a surprise, the reveal of the Daleks in the ship is still quite good, especially as the Doctor suddenly shows that he knows his hidden companions are there by simply whispering with gravity: “Polly, Ben, come in and meet the Daleks.” When the one suddenly slithers across the floor in the first cliffhanger it is a great reminder of what the Daleks actually are, something that had not been referenced in the show for a while. Even more surprising seeing the ones being grown in the ‘nursery’. What is especially well-realized in this story is the pacing of suspense as we see the colonists tricked into thinking the Daleks are serving them. We know this is not true, and there’s a real tension as the Doctor tries to convince them not to be taken in. The Dalek shouting repeatedly “I am your servant!” over the Doctor’s insistent but ignored pleas is quite disconcerting. This is also one of the first times that the Doctor talks about the Daleks in a tone of fear and recognition of their menace (“One Dalek?” “Yes, all that is needed to wipe out this entire colony.”) which helps add to the tension. Actually, it’s interesting that the Dalek becomes a bit of Rorsharch test; Lesterson wants to believe the best of them and thus can’t recognize its gun as a gun. As more and more people start to try to manipulate the Daleks for themselves, the tension of knowing bad things are coming mounts and moves the story along. This story is perhaps the first true taste of horrific danger and helplessness that Ben and Polly face and it obviously grows them as companions. Meanwhile, the Doctor deals with some of his change as well. 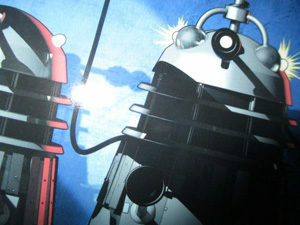 At one point frantic about the Daleks, he states: “I know the misery they cause – the destruction. But there’s something else more terrible – something I can only half remember.” It’s never revealed what he is referring to—which leaves lots of interesting possibilities for side stories. 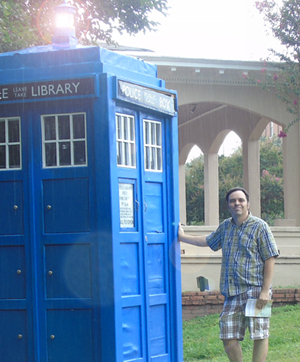 But the camaraderie and joking we see in the ending scene as the Doctor and his companions return to the TARDIS (not too mention the Doctor’s wink-and-nod at his returned self-assurance) is a nice bookend contrast to the confusion and distrust post-regeneration when they first arrived. It sets up the future for the second Doctor quite well. There are lots of nice little dark touches in the story: the shrill and so obviously dishonest “I am your servant!”; the Dalek that almost lets slip his true feelings because of its disgust at being compared to an inferior human (“A Dalek is bett… is not the same as a human.”); the quite surprising reveal that the assistant shot by the Dalek was dead not injured as we had been told; the slowly and secretly increasing number of Daleks; Lesterson going wonderfully mad (“They’re the new species, you see. Taking over from homo sapiens. Man’s had his day. Finished now… All we can do is marvel at the creatures who are taking our place.”) The inevitable slaughter at the end is a bit slow but incredibly dark—one of the darkest hours of Dalek menace in the show thus far. While the ending slaughter is just what the story calls for, the pacing of it falls a bit off with too much lag time and dialogue. It would have been better if the momentum had been kept up from the initial moments when the Daleks start massing and yelling “Daleks! Conquer and destroy!” Also, watching this episode as an entirely reconstructed animation is a bit misleading since the direction and visuals are much nicer than what they would have appeared in the original.